You Don’t Need Another Diet. You Need a Metabolism-Resetting, Fat-Melting, Energy-Boosting Lifestyle Shift! For the first-time ever, get FREE access to The Essential Oils Diet Bootcamp: A One-Week Program Designed for Living Abundantly – Physically Fit and Mentally Healthy. Yes, I'd like to receive a FREE subscription to Natural Living Family News & related promotional offers. I am just feeling amazing! I feel lighter, more energized! I am stepping up the speed of my running and increasing leg and booty intensity in my workouts. For me, the biggest struggle when losing weight is the struggle with yourself. Do you struggle with yourself too when trying to shed those stubborn pounds? Beat the mid-day energy slump? Or balance your blood sugar levels? Hi! We’re Dr. Eric Zielinski (aka “Dr. 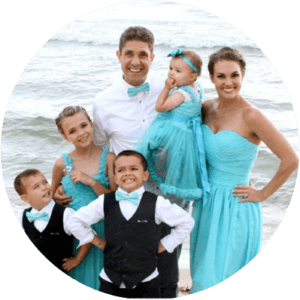 Z” ) and Sabrina Ann Zielinski (aka “Mama Z”), a husband-wife team who are passionate about empowering people to live their healthiest, most abundant life without sacrificing great taste or wasting thousands of dollars on powders and pills. 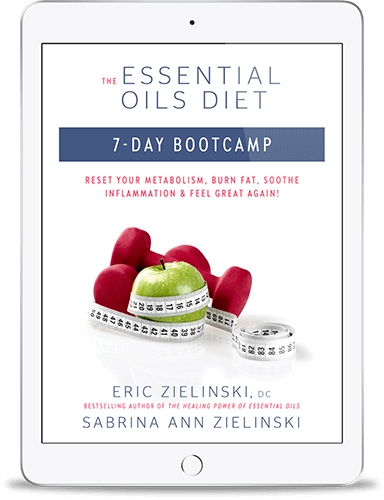 We’ve designed the 7-Day Essential Oils Diet Bootcamp to give you a jumpstart on creating healthy habits that melt fat, build immunity, boost energy and create a lifestyle shift minus the struggle and sacrifice. Join us and thousands of like-minded healthy living enthusiasts for a ONE-WEEK Essential Oils Diet Bootcamp that melts away fat with delicious, good-for-you, bioactive-rich foods, essential oils and easy-to-follow detox strategies designed to reset your metabolism, curb unhealthy food cravings, reduce inflammation and so much more! I’ve lost SEVEN POUNDS!! I haven’t weighed in over a week and was doing a happy dance this morning. Implement and start to watch your body transform today! It’s Never Too Early (Or Too Late!) To Start Living Your Healthiest Life! Whether you want to shed post-pregnancy weight or lose the pounds to enjoy an active lifestyle, the best time to start living your healthiest life ever was yesterday. Almost 40 percent of American adults are obese and 71 percent are overweight. Conditions linked to excess weight, including cancer, hormone imbalance, gut disorders, and type 2 diabetes, have also spiraled. The easiest way to burn fat, build lean muscle and increase immunity is a diet that’s rich in “bioactive compounds”. You don’t have to power up Google to find recipes rich in bioactives. Join the FREE 7-Day Essential Oils Diet Bootcamp and let’s show you how it’s done, complete with recipes, easy-to-implement detox tips and ways to use essential oils to help you lose weight! My face and hands are skinnier and the belly rolls are starting to roll away. And even though holiday sweets have appeared in the stores, I will not waiver! I am so thankful this challenge appeared when it did! “I’m 58 and I have a confession to make: I was very active in my youth and early adult years, even playing on a women’s softball team… However, exercise has not been on my radar in many years, I just didn’t feel like it. Well, all that has changed now…This Bootcamp has jump-started my desire to get in better shape: Mentally and Physically. I know I am stronger now than I was prior to starting the Bootcamp. The first improvement I noticed (after the first week) was that a particular constant shoulder/back pain eased up and disappeared!! I had this constant pain upon waking up, I actually thought I needed a new bed, and then a new couch, because sleeping on either one was not relieving my pain! Are YOU ready to “lose inflammation and pain” and watch the weight melt away while you dig into your delicious meals everyday? If you haven’t made Mama Z’s chocolate avocado mousse with coconut whipped cream – run and make it!!!! It is so yummy. Think that weight loss equals taste loss? With the Essential Oils Diet Bootcamp, you’ll get easy-to-make recipes and high-impact detox strategies for the perfect kickstart! It’ll make living the abundant, healthy and fit life, as easy (and as tasty!) as eating chocolate avocado mousse! This is NOT for you if you want a quick fix. There are plenty of fad diets for that. This is a lifestyle shift designed to help you create healthy habits that last, retrain your taste buds and reset your metabolism, one delicious day at a time. We know what it’s like to be sick. Between the two of us, we have suffered from chronic pain, leaky gut, eating disorders, cystic acne, depression, and even suicidal thoughts for years. And (thank God!) we know what it’s like to recover. NOT by using conventional medicine either! In fact, medicine failed us and it literally took more than a decade for us to come up with the natural solutions that were just right for our bodies. Learning about essential oils has been an important part of our healing journey and we are committed to sharing our research with the world. Before we launched our website in 2014, we used to help educate and coach people for free because we could truly empathize with their suffering. All this started back in 2003. It was our joy to serve our friends, family, and neighbors. We never imagined that our natural living resources will reach more than 5 million people every year. This is why we are devoted to serving the world with as much free Biblically-inspired evidence-based, content as possible online.This is also why we give so many FREE resources to help guarantee that your Essential Oils Diet journey will be a success. We hope you take this FREE 7-Day Essential Oils Diet Bootcamp because we know it will be a game changer for your family and you. It brings us more joy, than you can imagine, to see so many people regain control of their health with our natural living tips. And, it is our sincere honor to guide you along your journey toward abundant living!